CLARK—One of the largest remaining farmsteads in Union County has been transformed into the Esposito Farm Park on Madison Hill Road in Clark. The $2.9 million cost of the new 13-acre county park was funded through the Union County Open Space, Recreation and Historic Preservation Trust Fund. CARTERET—Mayor Dan Reiman joined with Councilman Randy Krum this week to announce that Carteret Park’s baseball and softball fields are undergoing reconstruction. Made possible by Carteret’s local Open Space referendum, $35,000 has been earmarked for materials needed to upgrade turf and surrounding amenities for Umansky Field and Leniart Field, with another $35,000 for in-house labor. Adjacent to Carteret Middle School, the fields were first constructed in the 1960s. According to Randy Krum, both fields are used extensively by the middle school and high school, along with the number of recreational leagues the town hosts. Age, usage, and poor drainage have contributed to the deterioration of the fields, according to the Borough Engineering Department. Both facilities will receive new infields, along with new batters boxes and new pitching mounds. Other upgrades will include new fencing, sidewalk repairs, and drainage improvements for both fields. As a cost saving measure, all work will be performed in-house by the Parks Department, and overseen by the Engineering Department. TRENTON – Legislation Assembly Higher Education Chairman Patrick J. Diegnan and Vice-Chairwoman Pamela Lampitt sponsored to revise the popular NJ STARS I and NJ STARS II college scholarship programs to ensure their long-term viability was released from the Assembly Higher Education Committee by a vote of 7-2, with 2 abstentions. Diegnan and Lampitt were members of a 12-member task force Gov. 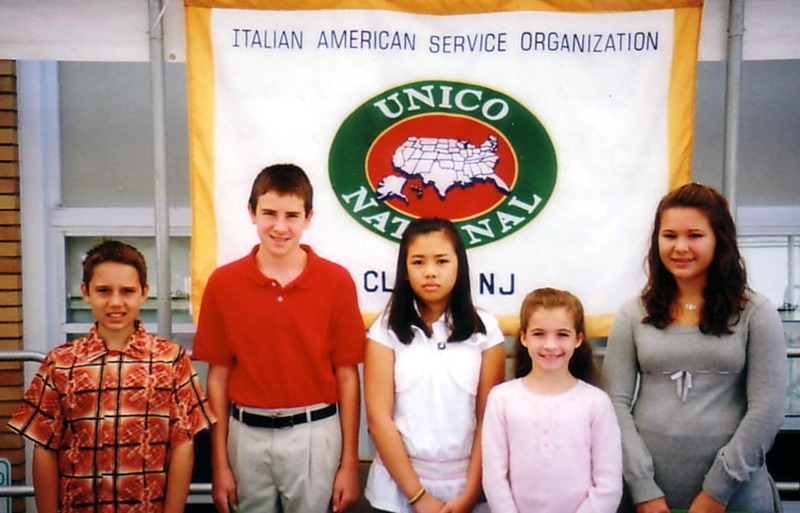 Jon S. Corzine convened during the summer to examine the NJ STARS program. The task force developed a plan to strengthen eligibility standards for entrance to and continuation in the program, ease the financial burden on the state’s four-year colleges and, most notably, ensure the program’s stability. Halloween Art—Students enrolled in Rahway High School’s Advanced Art class recently spent the day in downtown Rahway decorating windows of local businesses as well as the Rahway Public Library for Halloween. The trip, under the leadership of art teacher JoAnne Campanelli, continues a tradition of service to the community. 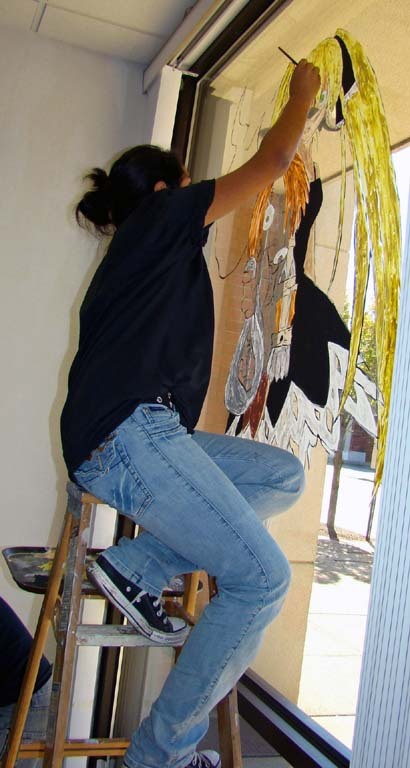 Above, a student from the Advanced Art class paints a window at the Rahway Public Library. Below, junior Samantha Smith concentrates on the template for her mural. Supporting Positive Behavior—Mayor Jun Choi presented a proclamation to Woodbrook Elementary School for its successful Positive Behavior Supports in School program. Choi presented the proclamation at an outdoor assembly in which the J.P. Stevens Pep Band entertained the crowd the J.P. Stevens cheerleaders performed cheers about respect and responsibility. Students won raffle prizes for their positive behavior. In the beginning of the school year, students were taught about the benefits of positive behavior. All 805 students will continue to participate in the program for the remainder of the school year. 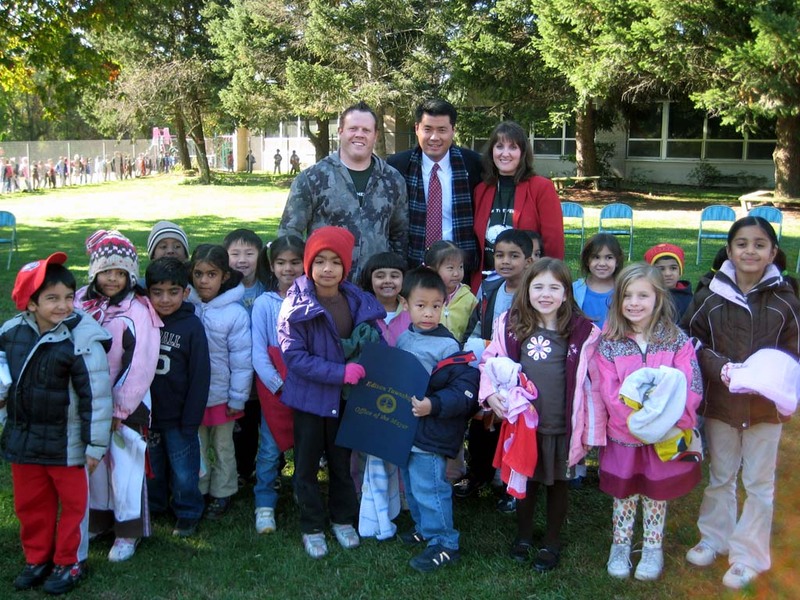 Pictured from left to right are Kindergarten teacher Andrew Brown, Mayor Jun Choi, Woodbrook Principal Nicole Cirillo and Brown’s kindergarten class. 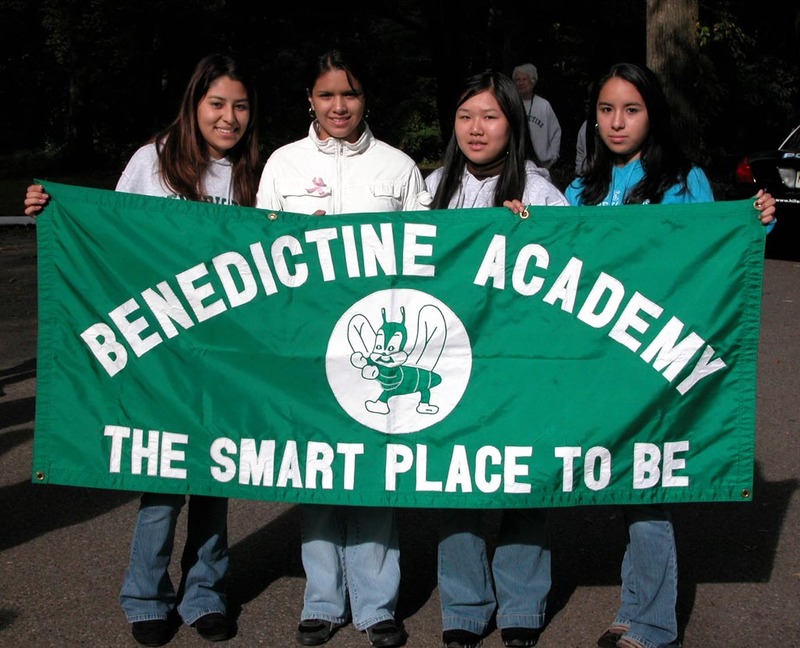 Fighting Breast Cancer—Seniors Stephany Sanchez of Newark, Ninoshka Celi of Elizabeth, Erika Yang of Hillside and Stefannye Barragan of Newark led their entire school community’s participation in Benedictine Academy’s Annual Breast Cancer Walk-a-thon on Oct. 8. Students raised more than $2200, which will be contributed to the Susan G. Komen for the Cure Foundation to be used to wipe out the disease.